KUALA LUMPUR: Young people who have been complaining that they cannot afford to buy houses at affordable prices can now look forward to buy one that will be launched under a public-private partnership in two months. The Government would provide the site and the developer would implement the project based on the industrial building system, said Prime Minister Datuk Seri Najib Tun Razak. “If possible, they (the private sector) turn this into a corporate social responsibility project and not for profit,” he said in an interview with Hot FM radio station at Sri Pentas here yesterday. The one-hour programme was also aired live on 8TV. Najib said the initiative was started following comments conveyed through his Facebook page and in newspapers about the difficulties faced by the younger generation in owning a home especially in the Klang Valley. Under the My First Home Scheme launched by the Prime Minister on March 8, those aged 35 and below, earning less than RM3,000 per month, are eligible to buy a house priced at RM220,000 and below. The Prime Minister was also asked about the public transportation National Key Result Area (NKRA). Najib said there was progress but its impact will be more profoundly felt in the next two to three years. The interview was also punctuated by light moments and friendly banter between hosts Fara Fauzana, Faizal Ismail, Kieran and the Prime Minister. At one point, Najib was asked about the upcoming match between Barcelona and Manchester United (MU) in the UEFA Champions League Final. Being an MU fan, Najib said he hoped the club would win, but admitted that Barcelona had a strong line up. 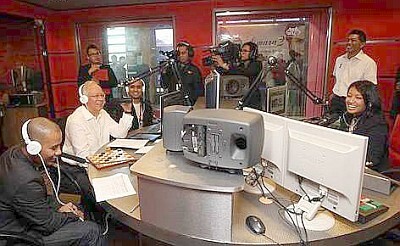 To a question on how he dealt with stress, Najib said he exercised regularly. “During my days as a student, I would ask my friends to play football or squash to minimise stress. “Now I go to the gym and get on the treadmill and cross trainer,” he said. Some of the Prime Minister’s favourite songs such as Kancing Suasa by R. Azmi, If Tomorrow Never Comes by Ronan Keating, Kaulah Segalanya by Ruth Sahayana and Nobody by Wonder Girls were aired during the programme. Najib said Kancing Suasa connected him with the Orang Asli in his Pekan constituency, saying they sung the song well.